CAMERON DAVIDSON is one of the USA's best known aerial and location photographers. The goal of his aerial photography is to show the interaction between man and land from a unique perspective. 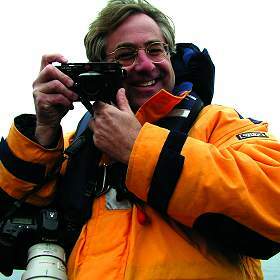 He started shooting aerials in 1980 while on assignment for National Geographic. A licensed pilot for twelve years, Cameron has several thousand hours of "backseat" time in Bell Jet Rangers, Hughes 500's and the occasional foray with an A-Star. Rather than fly and shoot at the same time, Cameron believes that working as a team with exceptional pilots allows him the ability to create compelling images without compromising safety. Three books of his photography have been published: Over Florida, A Moment of Silence (Arlington National Cemetery) and Our Nation's Capital: An Aerial Portrait. His editorial assignment work has appeared in National Geographic, Smithsonian, Audubon, Preservation, Air & Space, American Way, Outside, USA Weekend, Spirit and National Geographic Traveler. Awards include publication in several Communication Arts Photography Annuals, Graphis Photo and POY along with profiles in Communication Arts, Print, foto8 and Nikon World. A native son of the Sunshine State, Cameron is based near Washington, DC.